There are prototypes and there are prototypes. Some are needed to verify that a chosen detection technology actually works, some help scientists test one technology against another, some help them design sturdy detector infrastructure with little material budget, working power supply and cooling, while others set out to prove that it is possible to have full detector functionality with all electronics set up like in the final detector. And then there are those that do it all at the same time. The CALICE collaboration’s analogue hadronic calorimeter, or AHCAL, is an example of the last type. It is a prototype for a calorimeter – a subdetector that measures the energies of passing particles – that might one day be part of the ILD detector. It would work together with trackers, electromagnetic calorimeter and muon system to record, reconstruct, track and identify every particle produced in the collisions at the future ILC. The CALICE scientists are currently testing a prototype that takes a close look at detector infrastructure like cooling and power supply while at the same time comparing different kinds of silicon photomultipliers or SiPMs. These do the actual job of detection, and the collaboration is testing the latest and much advanced commercial silicon photomultipliers (SiPMs) from Russia, Ireland, Japan and Germany. The HCAL prototype consists of one module, which corresponds to a slice of one sector of the future calorimeter barrel of the final detector. It has 1000 channels per square metre and it shares the space in the test beam area with CALICE electromagnetic calorimeter prototype modules from Japan – a true collaboration that also shares the same readout electronics. It’s also the first time that these calorimeters are taking data in a hadron beam after a few runs in electron beams at DESY in Germany. …it gets installed and set up before starting its data taking run. “The readout isn’t working on all levels yet, but that’s what you’ve got to be prepared for when you go for test beams. 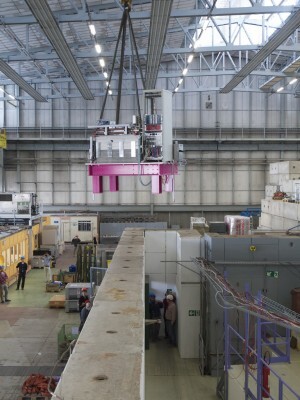 So we can still take lots of useful data,” says test beam coordinator Katja Krüger from DESY. “All shifters are eager to help and to get their hands on the data.” “In fact, more shifters signed up for this test beam than we would need – it’s a great opportunity for students to participate in this exciting commissioning phase,” thinks Felix Sefkow, AHCAL leader and also from DESY. The AHCAL is a combined effort of 12 institutes from Germany, France, Russia, the US and the Czech Republic, and CERN. After a period of poring over data and improving their understanding of the prototype, the collaboration is planning another test beam at CERN at the end of November. The active modules of the HCAL will also be used for testing the tungsten hadronic calorimeter prototype for a future CLIC detector.